As people all around the country are deciding who they want to be the next President of the United States, some HEART students are getting politically involved a little closer to home. Thanks to support from NYC Council Member Daniel Dromm, once again, a group of dedicated sixth, seventh, and eighth graders from I.S. 230 in Jackson Heights, Queens spent their Thursday afternoons learning about various issues facing animals and some proposed bills that would make a difference in the lives of animals in New York State. The I.S. 230 students participated in the 2016 version of the Animal Protection After School Club at their school. These students became experts on topics such as cat declawing and canned hunts and became honorary attorneys by learning the in’s and out’s of NYS’s animal cruelty statutes, Penal Code, and Agriculture & Markets’ laws. 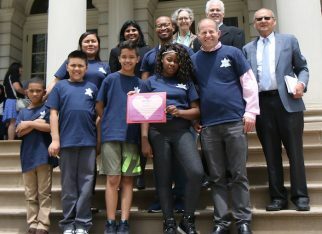 After watching “The Paw Project”, a film that highlights the journey of animal activists seeking to ban cat declawing in a number of California municipalities, the students, inspired by the documentary’s heroes, wrote letters to their elected officials, asking them to support a similar ban proposed in the NYS legislature. 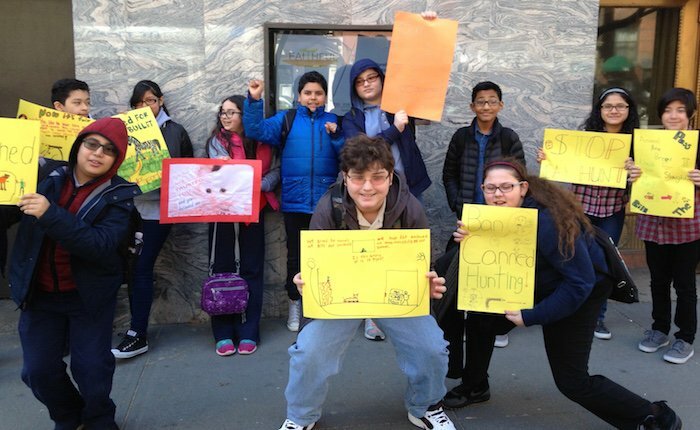 They also wrote letters and made posters after learning about the controversial practice of “canned hunts”, where people pay money to hunt an animal inside a fenced-in area with no means of escape. On March 30th, after weeks of preparation and learning, the students embarked on a journey across New York City to meet with the offices of elected officials. The students came prepared with their knowledge, passion, and love of animals and were determined to give New York animals a voice. Their first meeting of the day was with the office of Assemblymember Linda Rosenthal, a champion of animals in her own right. The students had a long meeting, discussing the issues and bills with Assemblymember Rosenthal’s dynamic Chief of Staff, Lauren Schuster, and Legislative Director David Karopkin. Everyone walked away from the meeting energized and ready to get the bills passed. The students then took this positive energy into their other two meetings for the day. They met with the offices of Assemblymember DenDekker and State Senator Peralta, both of whom represent the districts that I.S. 230 is a part of. Though it had been a long day, the students were able to articulately and persuasively discuss just why it’s so important that their bills be passed by the legislature. The students’ impact was palpable, as each person they met with complimented them on their professionalism and mastery of the topics involved. The meetings were an unbridled success.